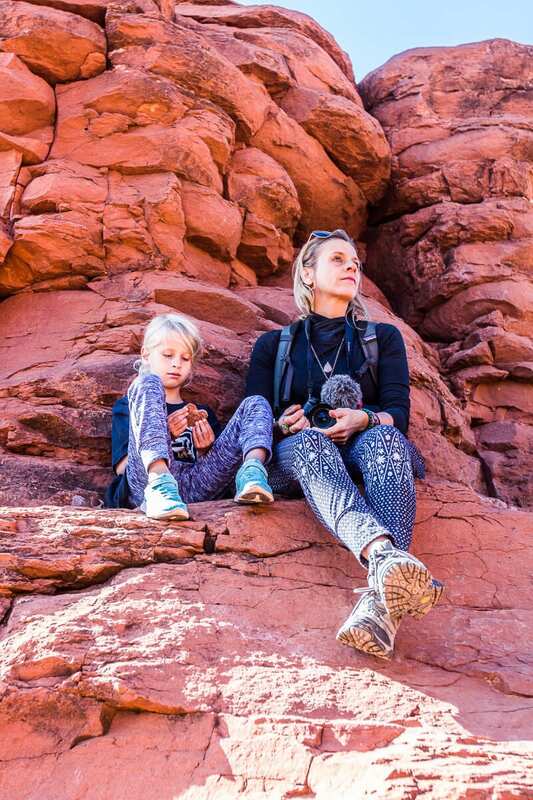 If you’re new to this concept of vortexes and feeling energy, you may struggle to have an experience at the Sedona Vortexes – well at least one you are aware of and can connect to. You may not even want to tune in or believe in any of this woo woo nonsense. That’s okay. I have had a daily meditation practice now for about 7 years. I could write a book on how positively it has changed my life. I would not have this life you see on this blog without it. I’ve also participated in deep meditative and chakra healing courses. I’ve even learned how to read past lives. If anything is out of balance in my life or body, my first response is to see an energy healer. I regularly get my chakras cleansed by a healer. So needless to say I have a ton of experience and wisdom when it comes to energy – how to tap into it, how to feel and experience it, what it feels like and how it can transform your life. I KNOW people think I’m weird for it. But I don’t care. As my life, most of the time, flows effortlessly with joy and I KNOW it is because of how I work with energy. Bring on the weirdness! Only Zen and abundance in my world! I’m guessing since you’re reading this post about vortexes in Sedona, Arizona you are at least mildly curious and want some insight into where to find them and how to experience them. By that I mean if you feel something, wonderful, if you don’t feel anything, wonderful. 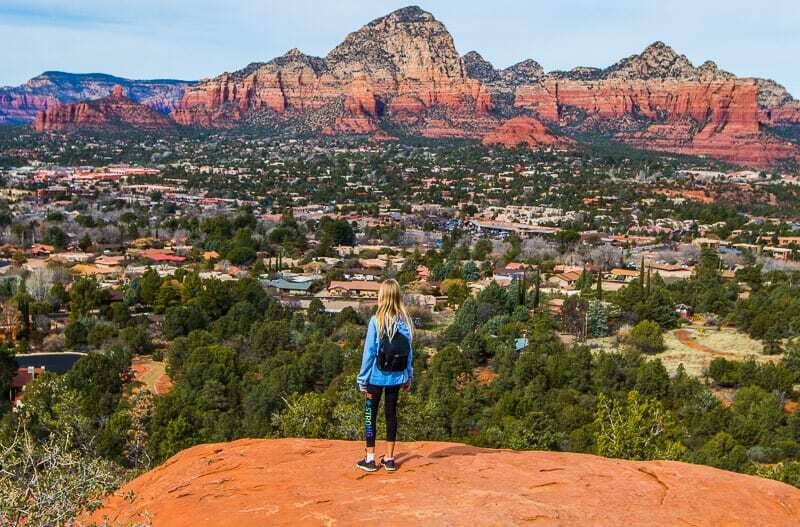 Sedona has developed a reputation around the world as a spiritual place of enlightenment. You will find a large community of healers and spiritual practitioners. The town is filled with crystals and mystics. People who love this kind of spiritual way of living are drawn to this region. Me included. 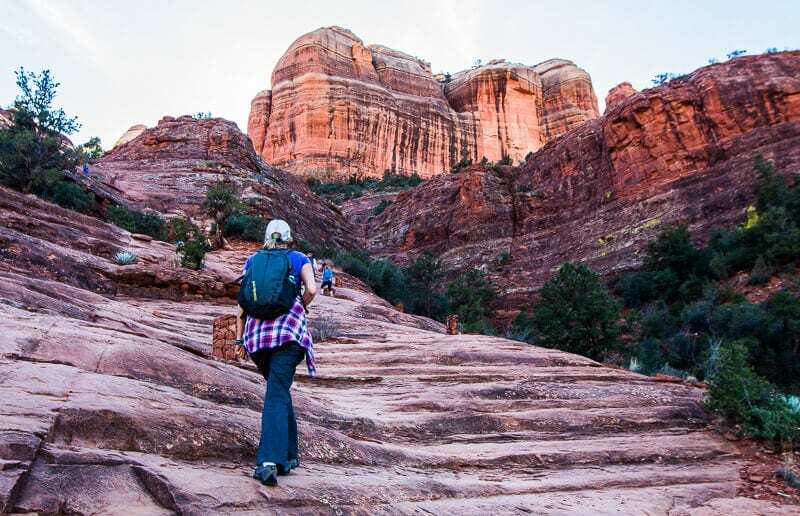 You’ll experience enough light and joy just by being in the presence of those rugged red cliffs. The color is strong enough to ground you at the same time and help you feel present and alive. 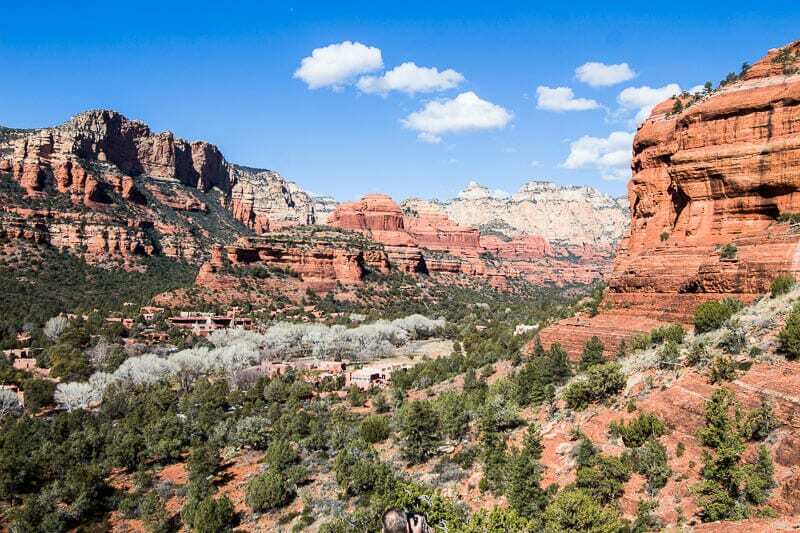 In reality, how can one tell if it’s just the stunning landscape that is heightening your emotions and lightening your load, or is it in fact the Sedona energy vortex doing it. One thing you will be completely sure of – there is something spiritual and magical about this place and it definitely draws people in who want more of that in their life. 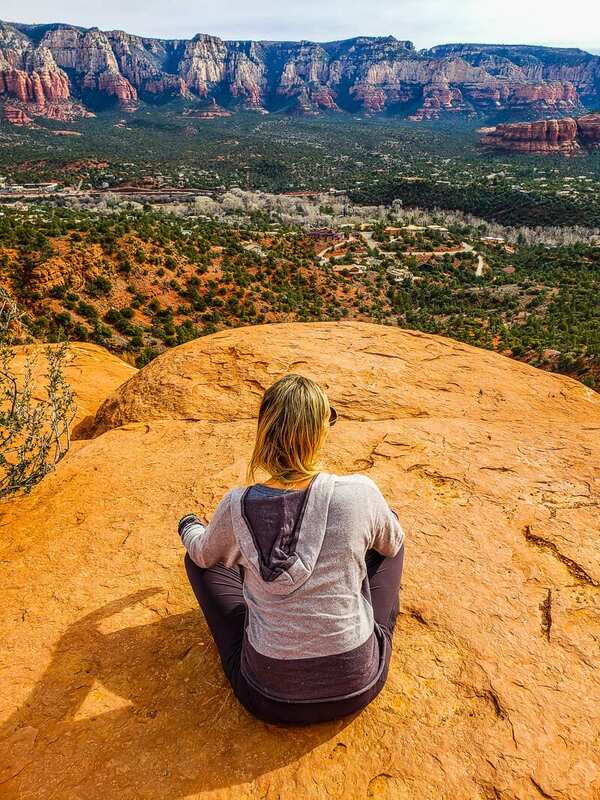 What Will I Feel from the Sedona Vortex? What if something weird happens to me? 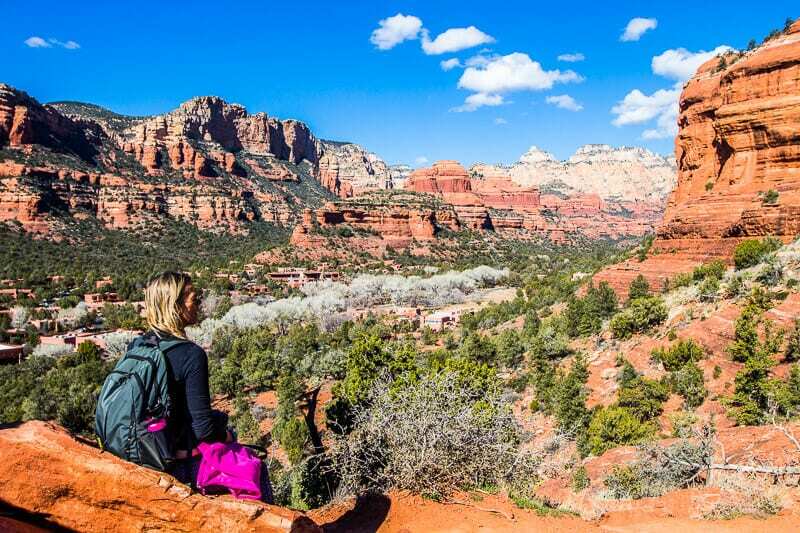 Where Can I find the Sedona Vortex Sites? A vortex is thought to be a swirling center of energy that has powerful ability to heal, calm, and give insights and clarity to transform your life. These are places where the earth seems especially alive with energy. You cannot see a vortex but you can feel it. 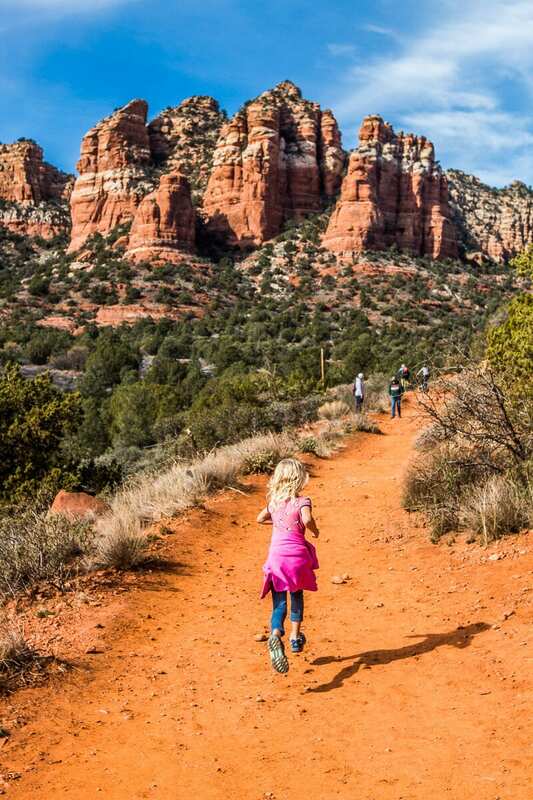 Sedona is special as it is said to be full of vortexes. You’ll know as soon as you arrive that this is some kind of special place. I had tears in my eyes when the red rocks first appeared on my horizon. I was so overcome with what I was seeing in front of me. I don’t think I’ve ever had that happen to me before. There are no words to explain the power those rocks emanate. Is it masculine or feminine energy (and what does that mean)? Vortices, or vortexes as most people call them, have masculine and feminine energies or a combination of both. Feminine energy is when the energy flowing enters the earth from above. It has introspective power that connects you to memories and past lives. It’s a subtle powerful energy that encourages you to become calm, slow down and grow quiet. Masculine energy is when the energy exits the earth with an upward flow. It’s supposed to bring joy and rejuvenation and inspire creativity. It’s very hard to say as you can feel a wide range of things. You may feel tingling, or an upsurge of emotions. You may want to release through tears, dancing or yelping. You may feel nauseous or dizzy or tired or just reflective. If you meditate often and are used to feeling energy, you could possibly feel a powerful surge, or a pulsing, especially around your chakras. You may get sudden insights or clarity. Or you many not feel anything other than inspired, recharged, and tranquil with a pleasant sprinkling of joy. The spiritual energy you take in at one of these energy centers can stay with you and affect you positively for days afterwards. Just remember the energy from a vortex spot is powerful, pure and healing. It can’t hurt you! So if something weird is happening, let it go and relax. Trust that something is getting processed through your body that is ready for healing. It’s better out than in. Drink plenty of water, get lots of rest, embrace silence and solitude and use it as a time to reflect. Write in your journal about what is happening, be willing to heal and change. As I said, I’ve been having these “weird” energy experiences for years. Sit with it. I promise it won’t hurt you. I’ve only ever grown as a better person and life has slipped into greater ease, effortless flow and joy as a result. Plus, it’s fun and keeps you connected to and humbled by the mastery of life we’re all a part of. 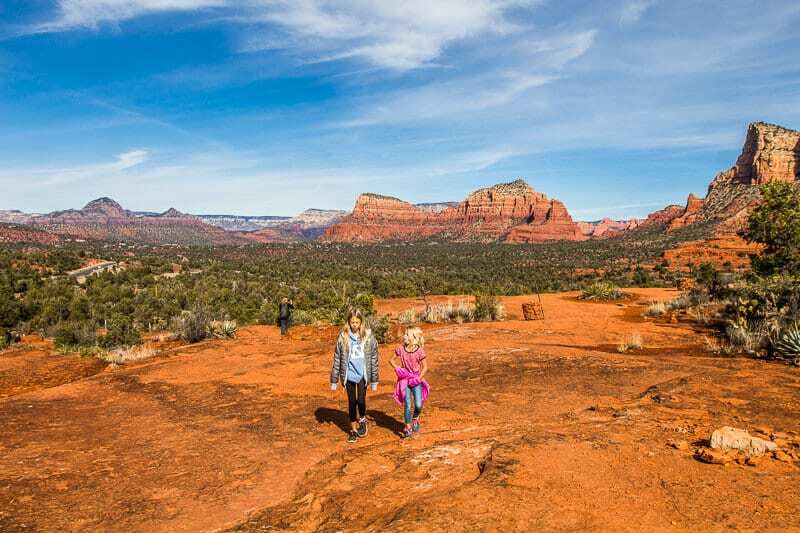 When you visit Sedona, the whole area is considered to be a vortex, but there are specific Sedona vortex sites where the energy vortex is super charged. Juniper trees respond to the vortex energy in a physical way that reveals where this energy is strongest. The stronger the energy, the more of an axial twist the Juniper trees have in their branches. It’s a good way, so they say, to tell if a vortex is in the vicinity. 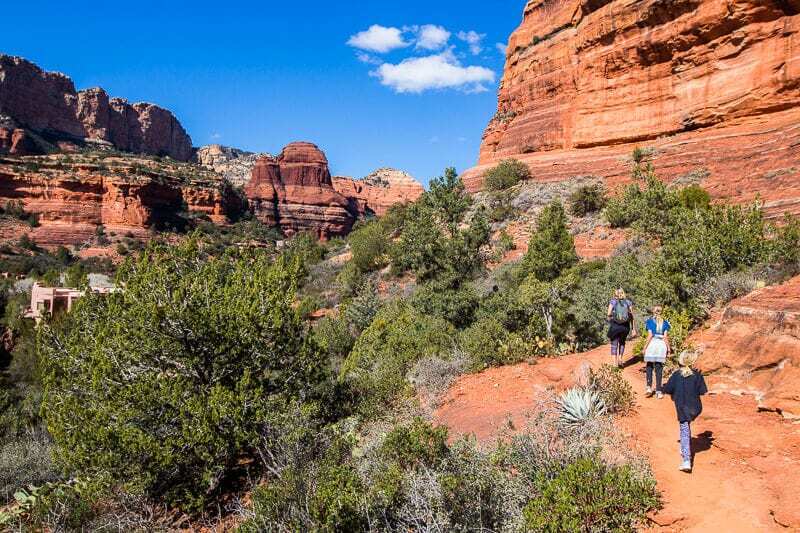 There are four main vortex sites in Sedona, all of which are easily accessible on hiking trails. 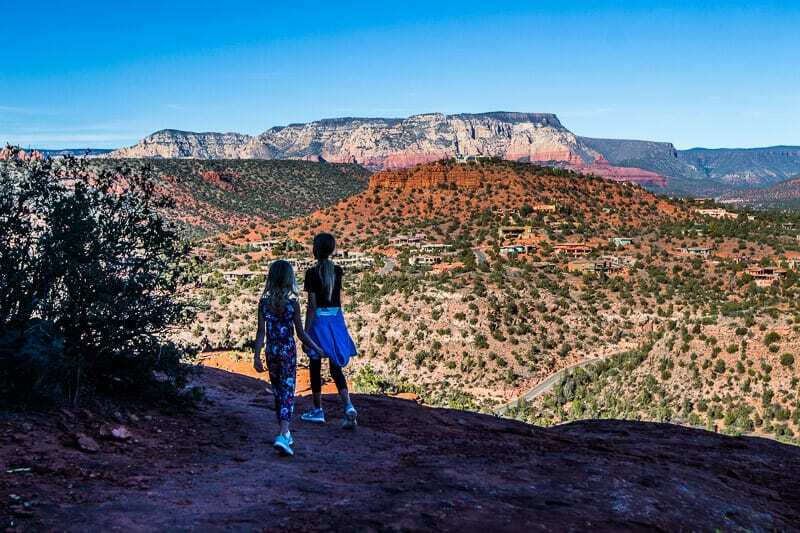 I’m going to share with you the five Sedona vortex hikes we experienced and what each felt like. Each vortex has a different feeling and transformative power. You will probably see people meditating, practicing yoga, praying or performing other rituals at the vortexes. Please be respectful and quiet. 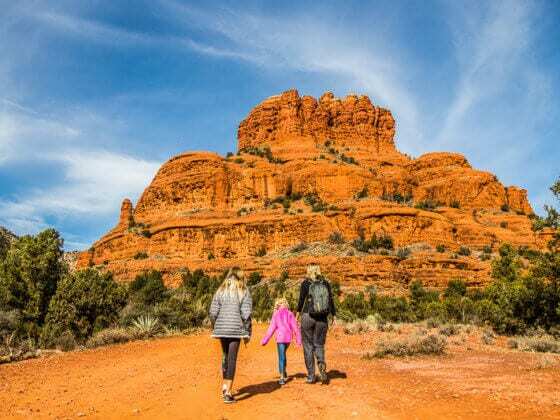 If you want a more in-depth experience there are several companies, individual guides and healing practitioners that offer Sedona vortex tours. You can learn more about this jeep tour to the vortexes here. We were happy to explore it on our own, but I would like to experience one of those tours another time. 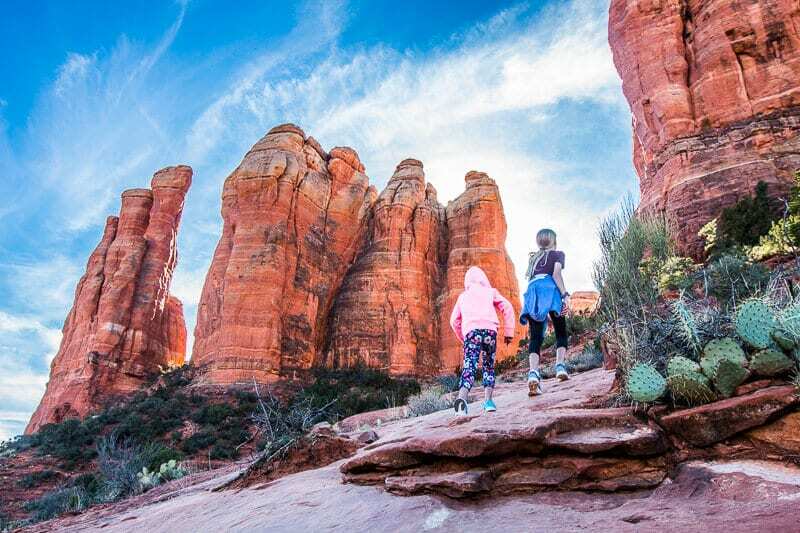 An experience at the Bell Rock Path will bring you back to the unencumbered playful nature of youth. 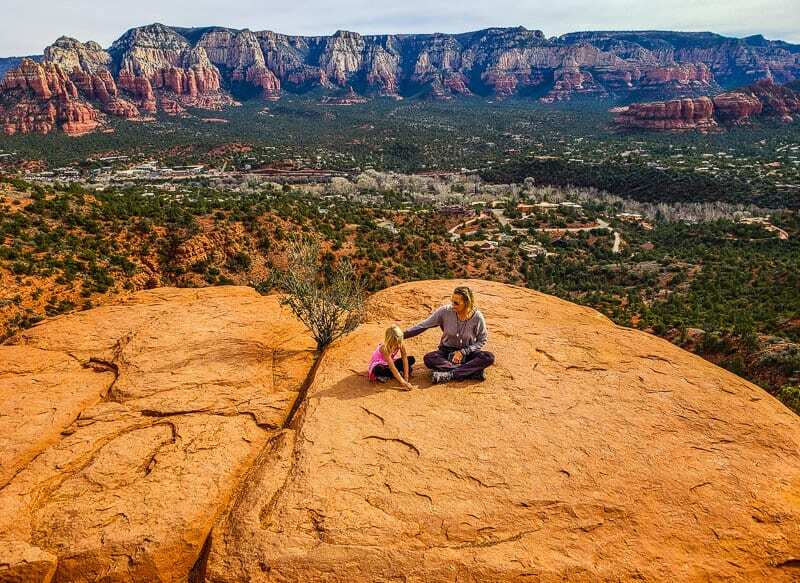 As soon as you drive up to Bell Rock and the Courthouse vista you are entrenched and ready to jump out of your car door to go play. It’s a fun place to be and the kids will especially love it. 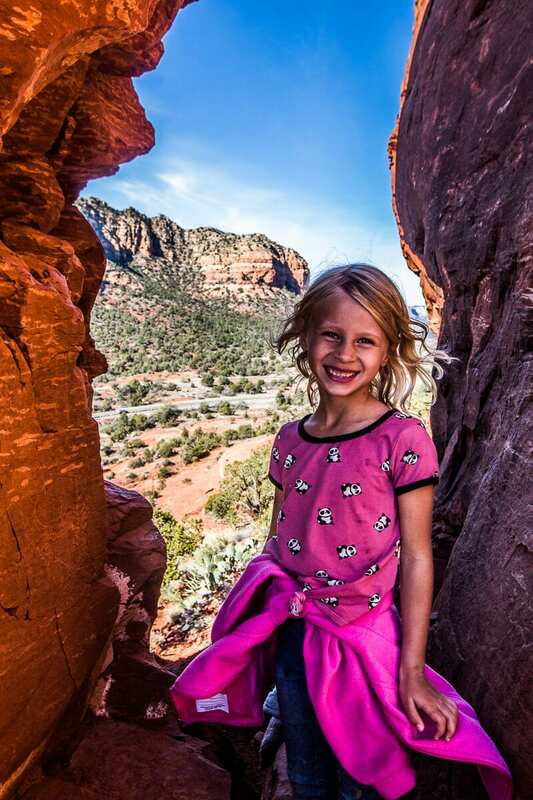 Savannah – who is a naturally joyful, playful and curious child, fully embraced this experience. She was leading us up the rock, supporting her sister who felt a little nervous about the heights, and demanding that we all keep going to the top. What she failed to see was the sheer drop off the narrow path that her mother’s eyes could see. We made it halfway up the rock and got to enjoy the exquisite views out from both sides of Bell Rock. We sat down for a snack break and to soak it all in. I definitely felt playful here, which is evident in our video with Craig singing and me dancing in the background. It’s not normally what we do, but we were just overcome with joy and a desire to celebrate. Where is the vortex on Bell Rock? 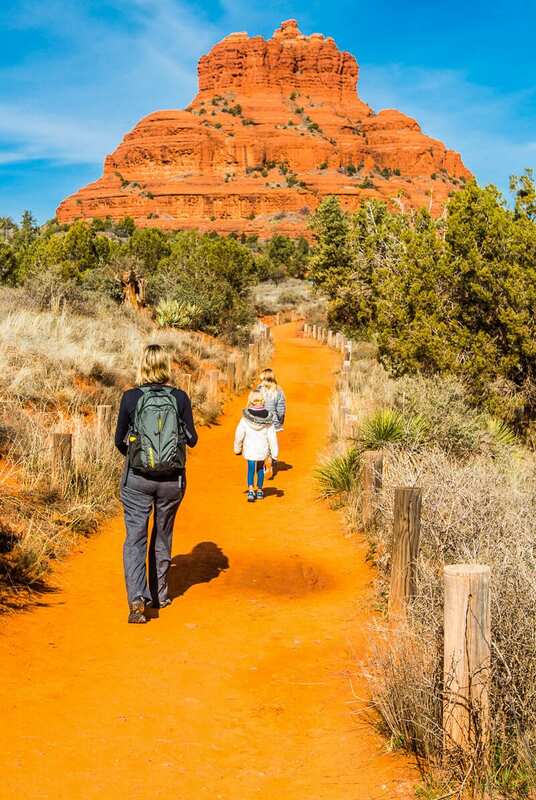 There is a 1 mile red dirt track leading to Bell Rock. You can then decide if you want to climb it or just admire it from below. A trail leads from the north side up the rock that goes through a crevice in the rock to the south side. This was as far as we got and felt comfortable. You can continue up to the top. Just go as far as you feel comfortable. 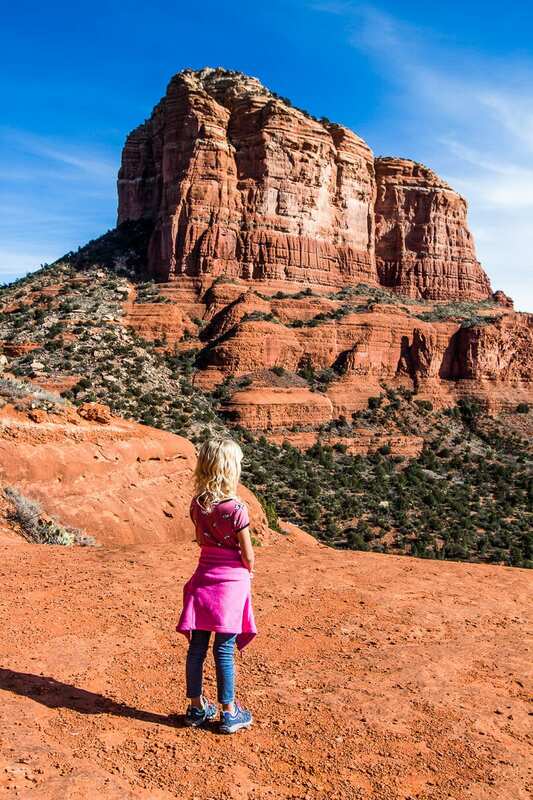 Many people believe the vortex is at the top of Bell Rock, but I believe that no matter where you sit or walk to on Bell Rock, you will feel the subtle energy of this vortex. You will even feel it from the track below if you ground yourself to its presence. Bell Rock has a masculine energy that is best for serenity and solving problems from a higher (spiritual) perspective. Whoa!! This one was powerful. I didn’t realize I was affected by the Airport Vortex until later in the afternoon and the next morning when I connected all the dots and solved the mystery. You can feel the special beauty of the Airport vortex as soon as you arrive. I didn’t really feel too much at the time of visiting. I was too enamored with the views to pay attention. I think I would say I felt calm and restful. Sometimes it won’t be what you feel during your time with the vortex but after that is important. The energy of a vortex is healing which means once it enters your psyche it can start working to help heal or raise your vibration. Sometimes this takes time and sometimes, because it is cleansing, you can feel pretty awful. Once we left the Airport Vortex we hiked the 3.3 mile Airport Loop (So beautiful. Do it). At the end of the walk, once we got in our car, I started to feel awful. I had been experiencing dry, flaky skin on my eyelids, which can happen to me when I eat the wrong foods. I’m trying to narrow it down, but my estimates of the culprit would be gluten, diary or corn – also the dry desert climate doesn’t help. Once I got in the car, my eyes felt inflamed and were stinging. Then my ears and my scalp started burning. My brain was really foggy and I could barely see or think straight. I just wanted to shut the world off. I battled through lunch and felt like the waitress was staring at me in a very unusual way, like she could see right through me and knew what was going in. By the time we got in the car to go for a drive, I was wiped out. I couldn’t keep my eyes open and my head was still burning. I was wracking my brain trying to work out what on earth I had eaten this time. It’s so hard when you are traveling and eating out as you don’t know what oil the restaurants are cooking with or putting in their food. As soon as we got back to our travel trailer, I collapsed on the couch, which is a rare thing for me to do, but I just needed five minutes of stillness to get myself together. I’m sure as a parent you know lying down doesn’t happen for long. I got up and continued on with the evening preparations. It wasn’t too long before the fog suddenly cleared and I felt light and energetic. It was an energy I recognized all too well. I regularly see energy healers and have my chakra cleanses so I know what it feels like. I suddenly got an insight to put some manuka honey on my eyes – why had I not thought of that before? I felt much clearer. Still a little inflamed and off kilter but better. I jumped on to Google to see if I could confirm that I had experienced a reaction to that airport vortex. I did search burning eyes, ears and scalp metaphysical to see if there was something there and it came back that these can be signs of a spiritual awakening. I finally put Google down and went to sleep – a deep sleep where I didn’t move until my alarm went off. I needed it. That morning, I did my daily meditation practice which had been off for me for several weeks. I had found it hard to get into the mediation zone, my mind so full and clogged. I have a chakra cleansing meditation I do each morning. Everyone connects to the chakras in different ways. Some via seeing the colors of them, some through smelling the essence of them, and some like me, just by feeling the vibration of them. I’ve never really been able to “see” the colors of the chakras, only feel their energy. I was completely connected to the mediation experience as soon as I began and I vividly saw the colors of each of my chakras. It was striking how different this experience was. That morning after a visit to The Chapel of the Holy Cross (I’ll explain in that section what I experienced there) we randomly went into the New Age Spiritual Center and I found a book about the vortexes in Sedona. I flicked through it to see if I could learn anything and was amazed at what I read. The Airport Vortex is said to be one of the most powerful and is very good at helping to clean your chakras. It all made sense to me then. I had felt that my chakras had been blocked for some time, which is why I had been struggling with my morning meditation. When your chakras are unblocked after some time, you will feel exhausted and things will flare up – it’s cleansing you. It also mentioned wearing amethyst is a good way to tap into the airport vortex more. Well the day before I had bought an amethyst bracelet in Uptown Sedona as I knew amethyst was good for your third eye chakra. Mine was obviously blocked as I was having these eye issues and the third eye controls that. My third eye is never usually blocked. It’s always been quite open and intuitive and ready to peer into the future to guide me on the right path. No wonder I as so inflamed. Oh I forgot to mention when I woke up the stinging, redness and flaky skin around my eyes was 95% healed (and now a month later, I have had barely an issue with it, and it was a daily problem for a couple of weeks). Go the manuka honey and airport vortex. When you drive up airport road you will see a small car parking area on the left. It will probably be difficult to get a park and I recommend skipping it to park at the top of the airport overlook anyway. It will cost you $3 to park there but totally worth it. The airport mesa overlook here is especially popular at sunset and will be busy at any time of the day. 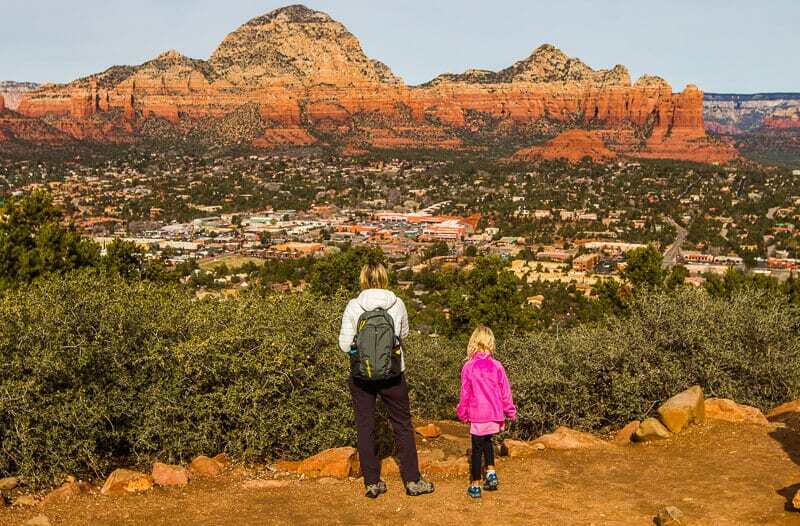 From the car park you will see a trail that says Sedona View Trail. Follow it 0.5 miles down to where you saw that small parking lot. 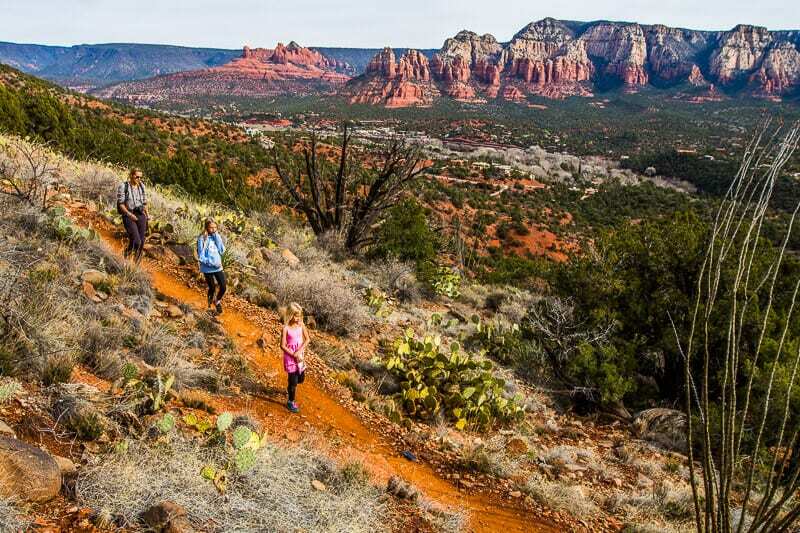 You will have drop dead gorgeous views of Sedona and the mountains on he way down. At the bottom you will come to a red rock clearing. On the right is the start of the airport loop trail. I highly recommend you take it. It’s a gorgeous hike and very calming and reflective. Turn left and you will see a small hill. This is where the vortex is. You’ll see a trail called summit overlook or trail. It’s very short, but a steep (somewhat) climb to the top. I actually found it easy so don’t fret. At the top you’ll get 360 degree views. I recommend just sitting here for awhile and soaking up the energy. Do some yoga or meditate if you want. The vortex here is powerful and cleansing – let it in and let it go. On our last evening in Sedona, we went to the Airport Vortex area to watch sunset. We were only there briefly and later that evening I had the same issue with my eyes and burning ears. It wasn’t as bad and didn’t last as long, but it did wipe me out again. I’ve never experienced that anywhere else and I doubt it was any kind of plant doing it to me as that hasn’t happened to me before. Also, after visiting the Airport Vortex the first time, both girls ended up with a stomach bug that lasted some time for Kalyra. With my mystic mind, I believe the energy was cleansing them and their chakras! We arrived at Cathedral Rock ready to climb it the morning after the Airport Mesa Vortex. The day was overcast and really cold. I didn’t think too much about that though and got of the car to get started. As soon as we got to the trailhead I stopped. Normally I’d be powering up there regardless of the weather or anything else. But suddenly I just felt a wall blocking me and I knew we couldn’t go up there today. Then I looked down and saw what Kalyra was wearing, grateful that I now had an even better excuse to not go up other than – there’s something I can’t explain saying no. For some reason, Kalyra had put on fashion boots instead of hiking boots and three quarter nylon Nike workout pants on. It was freezing and I knew she’d be whining and crying the entire way. So we turned away and went to the Chapel of the Holy Cross instead. When we’re talking about energy work, which is what the vortexes are – powerful energy work – you’ve got to let go and trust how they engage with you. I just knew that for whatever reason I was not ready for the energy of this place yet and I’d return when the timing was right. And when we did return the timing was so right! We hiked up on a perfect, sunny and warm afternoon. During the wetter months, there is a creek at the beginning of the trail that kids love to play in. Our girls did when they visited in September. It was just a dry creek for us on this visit. 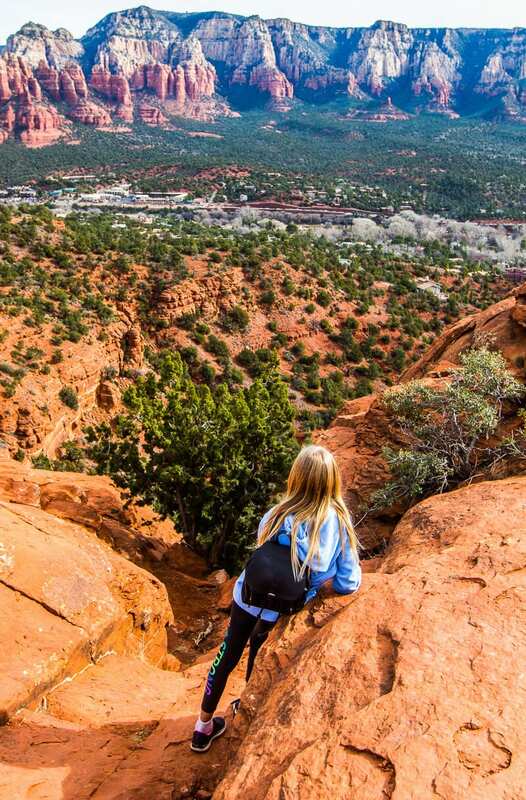 I will always remember this hike up to the Cathedral Rock Vortex for the strength and joy my girls displayed. 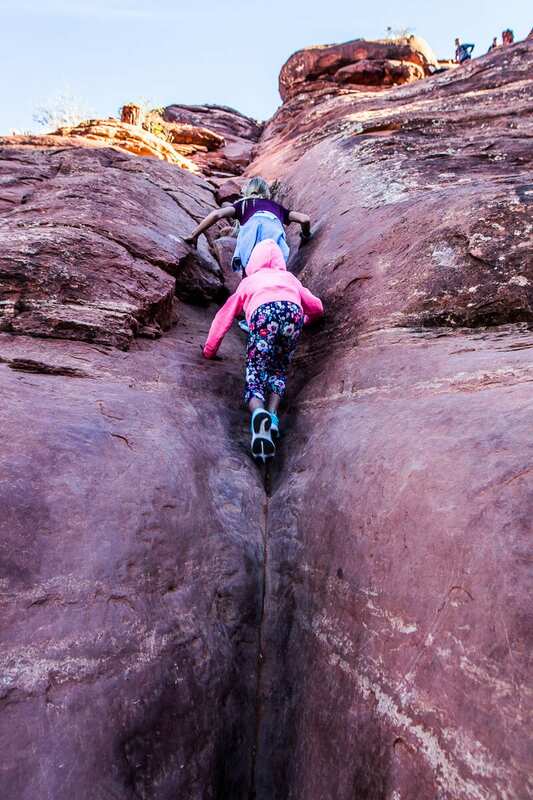 They took charge of the rocky path, refusing to give in when it involved a few climbs up over steep and smooth rock faces with only small foot holds to grab onto. From my research, I actually thought it would be much more dangerous than it was. I didn’t think we’d get to the saddle where the vortex is, but we made it up no problem. It’s only a 0.7 mile hike but it goes up 600m in elevation so it’s a steep one. It’s a walk that tests your strength and resolve. I think when you finally reach that saddle and peer up over at the 360 degree views, you feel a sense of victory and empowerment. So I can say that’s the energy I felt there – pure elation and empowerment. It could have been the endorphins from the exercise, but it also could have been from the Cathedral Rock Vortex. It’s predominately a masculine flow energy, and is said to be great for soaring and feeling inspired for greater oneness and serenity. Again, with such stunning views how could you not feel that way? The walls of both sides of the rock tower up high above you here. It feels like you are nearing the top of the world. High above the earth, yet still so far to the heavens. 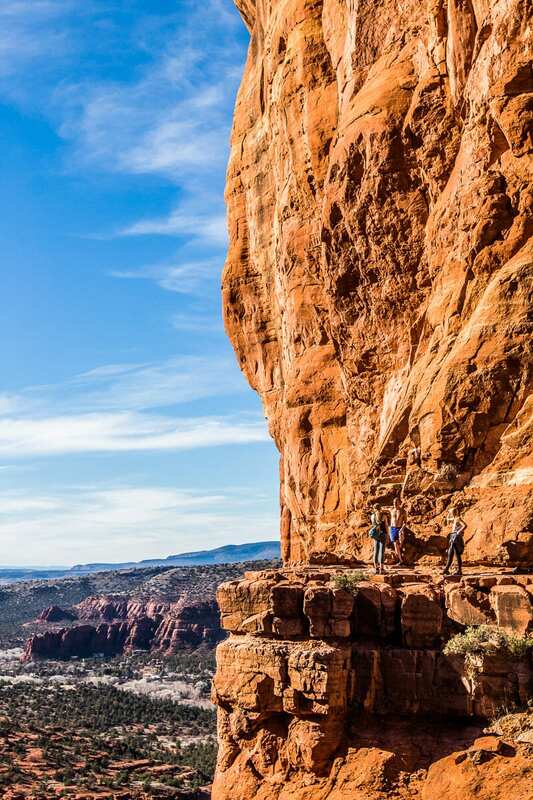 We enjoyed soaking up the views and watching two crazy rock climbers reach the peak – wow!! I told you – it’s all about elation and personal power up on Cathedra Rock. 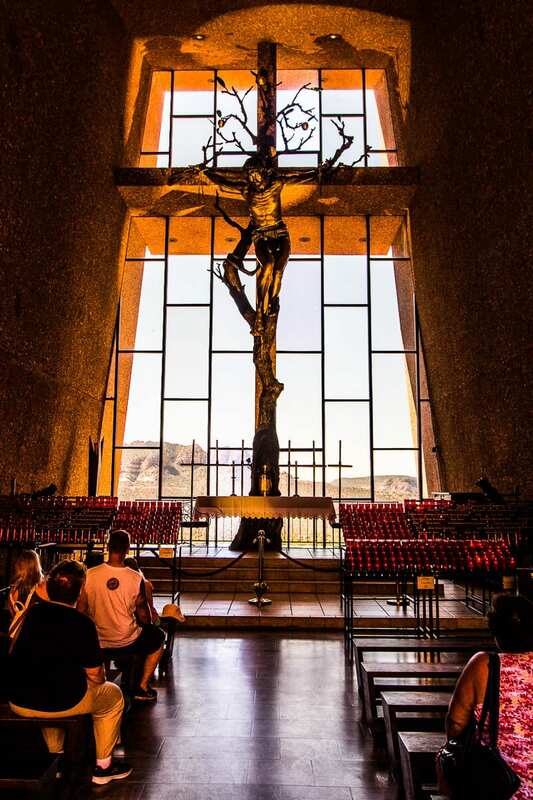 It was only during my frantic research about the negative airport vortex that I discovered the Chapel of the Holy Cross is also considered a vortex – and the one most people feel the most. 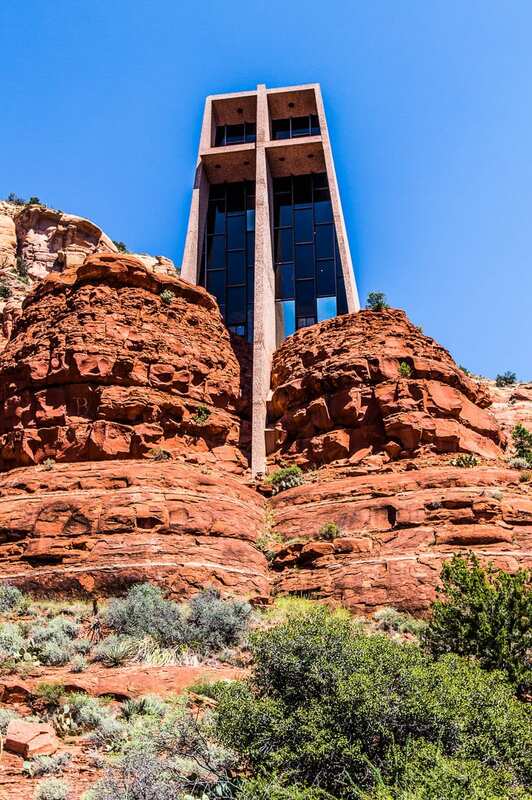 It’s a chapel built into the beautiful Sedona red rocks. 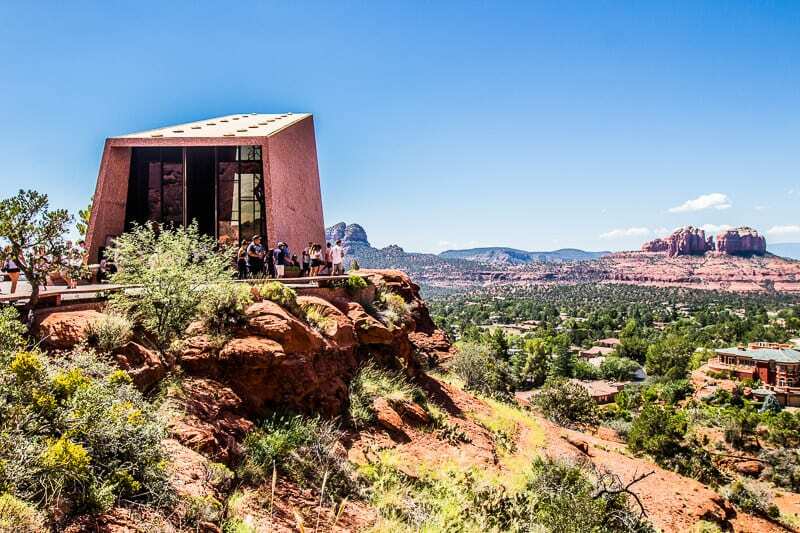 If you’re an architecture lover you will enjoy visiting this small chapel embedded into the rocks overlooking Sedona. Walking up here I felt surrounded by the vivid colors of orange. The light was soft and gentle making them pop to feel like a bubble surrounding me. I was raised a Catholic so am very used to a Catholic church experience. I helped the girls light a candle and told them to send a healing wish for someone they cared about as they did it. We then sat in the chapel l to look at the gigantic statue of Jesus on the cross. It was this vortex I physically felt the most with – a strong, swirling pulsing rush of energy through me. Now I’m very aware of what this feels like during my years of deep meditative practices. I felt very safe and secure here and very loved. I could have sat there for a long time in its presence, but of course, I have children who don’t like to sit still for every long especially in front of unnerving statues of someone nailed to a cross. Later in that book I picked up in the store, I read that the vortex here is one of all encompassing, unconditional love. Strange that it’s found in a Catholic church. The irony! I guess it’s the right kind of church. Driving back to our campsite after this (20 minutes away in Camp Verde) I began to feel really nauseous and dizzy. It was so bad I had to ask Savannah to stop talking. She is a chatterbox and was in her usual ask a million questions mode. I think she was asking me if we stacked a million people on top of each other would they reach the clouds. I had to press my head flat against the head rest until it passed. Could be just a coincidence but I believe it was energy healing happening? The Boynton Canyon Vortex is said to have a balance of masculine and feminine energy. Therefore expect to feel quite balanced at this vortex. I found it had quite a calming happy energy and the perfect place to meditate. It was very powerful to me. I felt quite a zinging and swirling energy moving through me here. It was pleasant in its strength though and very reassuring. Interesting to note as we approached this vortex, Kalyra was in a foul mood. She was argumentative and complaining about the stupid Sedona Vortexes. So I suggested that she sit down the bottom on the rock patiently waiting and wait until we come back down. I just knew she wasn’t in the right frame to go up there and I was at the end of my tether with her. Surprisingly she decided to sit down and stay. Savannah bounded up to the top of the saddle with me. 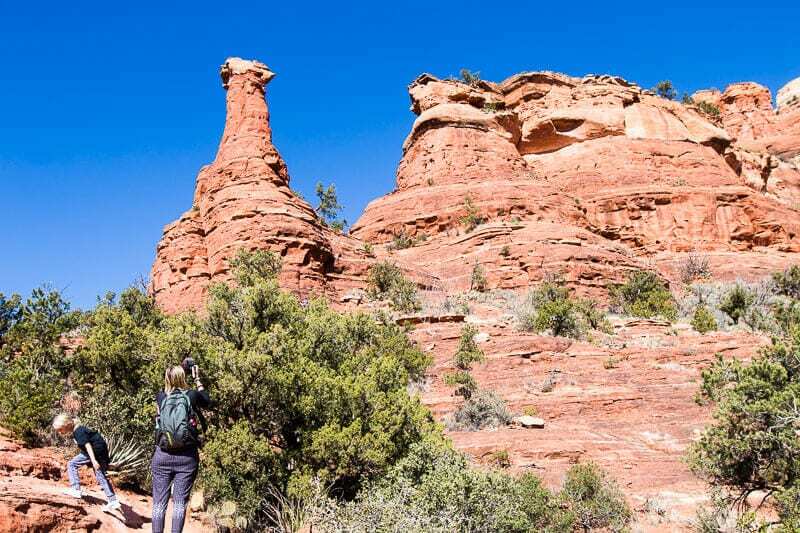 The Boynton Canyon Vortex is only a short 0.2 mile track detour on the Boynton Canyon Trail (at the beginning of it) up to the saddle which is between a rock formation known as Kachina Woman and a knobby hill. The Vortex is said to be on the knobby hill. The air here was very reverend. There were several people moving about very slowly and quietly. People were sitting on various places on the hill in quiet contemplation. It just had this presence of stillness and peace. It was very beautiful. Savannah and I found a place to sit in stillness together on the rock. 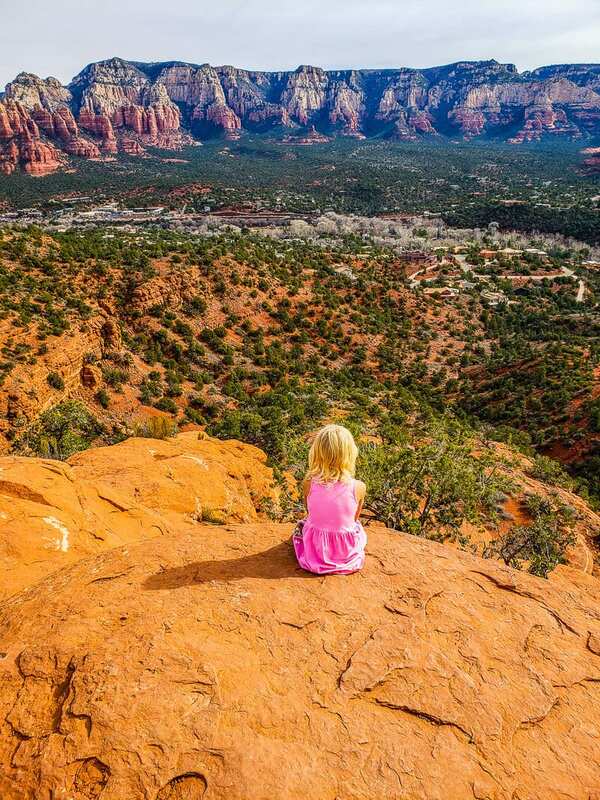 She was embracing the Sedona Vortexes with me and was happy to meditate. It was beautiful and the views are extraordinary into Boynton Canyon. 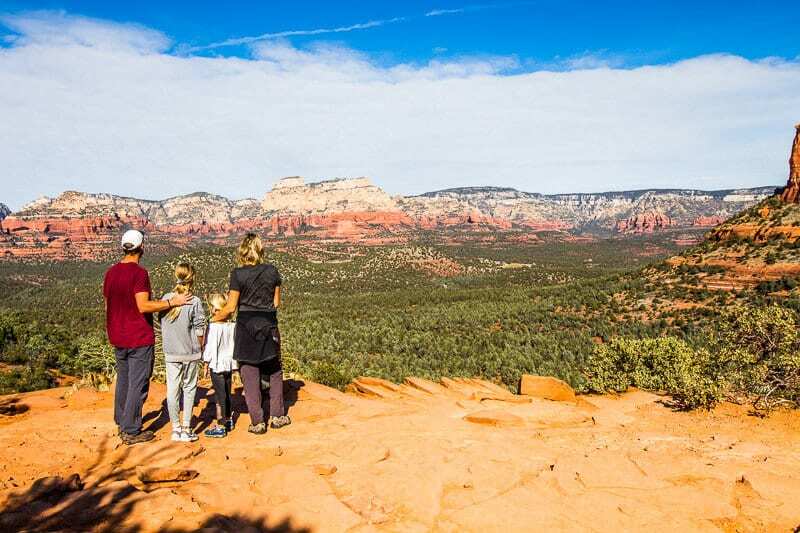 If you don’t care about Sedona Vortexes at all, you will love this spot for its views and peaceful nature. I’d love to stay at the Enchantment Resort here so I could easily run up to the vortex for morning meditation. Before we started our walk we heard beautiful flute playing in the distance from the parking lot. 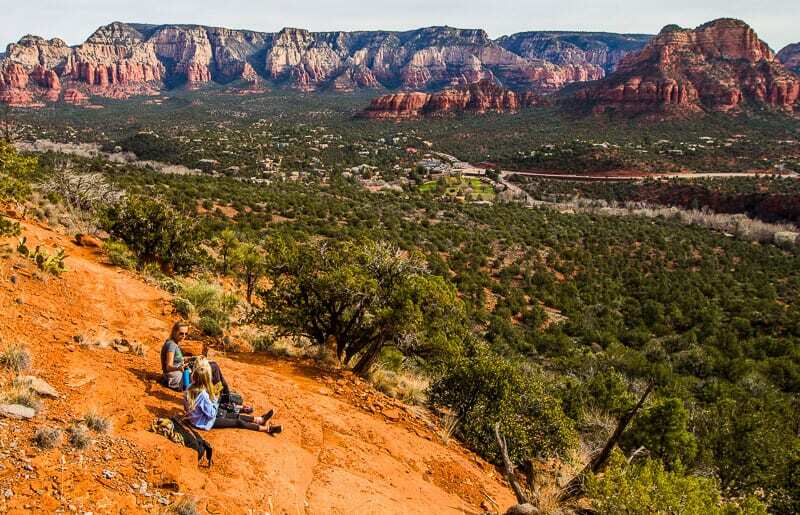 When we arrived a fellow Sedona Vortex seeker told us we had just missed the flute player. Apparently, every day at 10:30am and 2:45om he comes to the Boynton Canyon Vortex and plays his flute. He also hands out rock shaped love hearts. 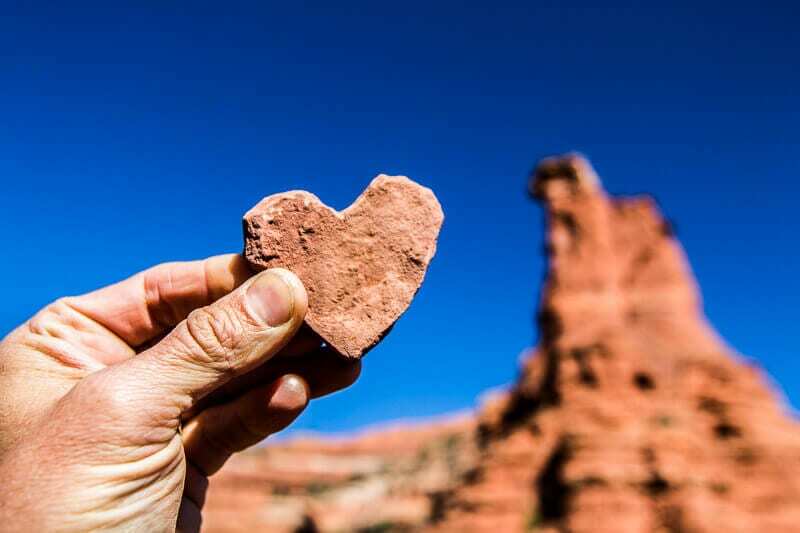 We were disappointed to just miss him but as we arrived at the saddle, a very joyful man stopped us to give us a heart shaped rock. It was him! He told us it was filled with the spirit of the Sedona energy vortex and unconditional love. 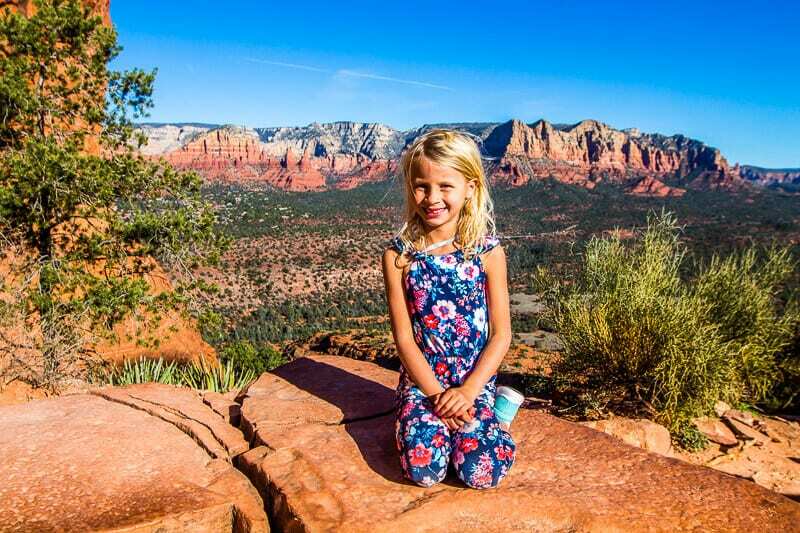 What a wonderful memento of our Sedona travels. When we reunited with Kalyra she was a completely different person. The man had passed her by on his way back down and given her a heart as well. She enthusiastically told us about that. For the rest of the day she was very light and positive and joyful, chatting away and asking us thoughtful questions. Had the Sedona vortex changed me or her? or both? We hit the Boynton Canyon trail then for a 6 mile return hike. The canyon is a spiritual center for the Native American Yavapai-Apache, who still hold private sacred ceremonies in the area. 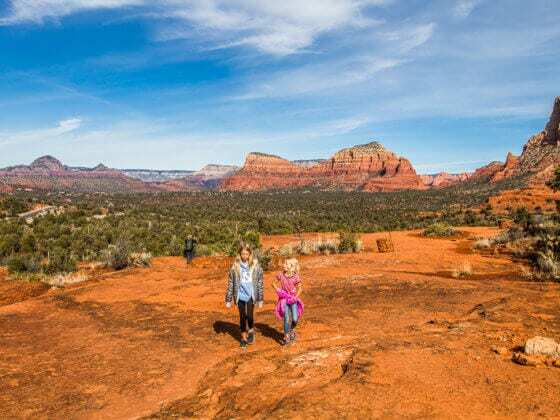 I had a spring in my step and a deep knowing that those Sedona vortexes were making magic happen in a quiet, unassuming, joyful way. I understand all too well the quiet power it has to transform your life without the need for expensive visits to the couch to bare your soul to a stranger to try and figure out what is wrong with you!! Just let the pure energy heal and uplift you. So simple. So easy. So joyful. So serene. And my goodness, so beautiful!! 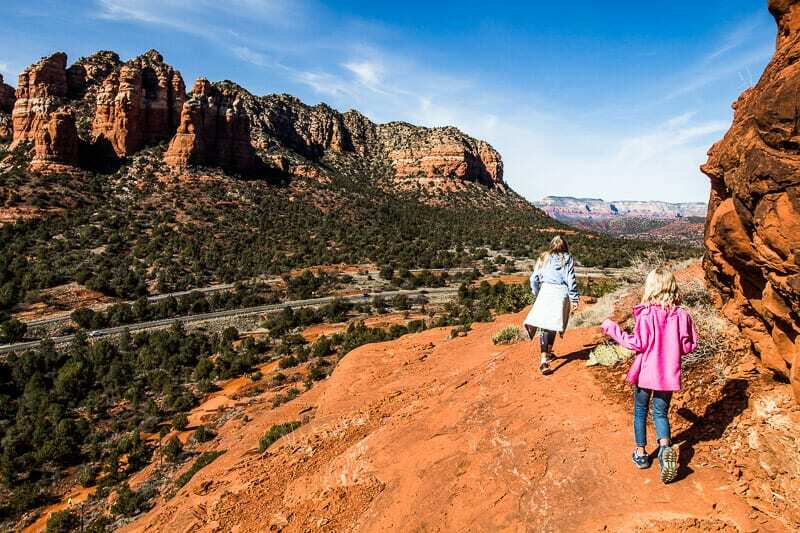 I’ve never been to a healing office quite so beautiful as what you will find in the open valleys, canyons and rugged cliffs or the Red Rock Country. I can promise you, if anything, you will leave with a lighter heart, a wider smile and loads of bouncing energy. Try it for yourself with an open mind and heart and let me know your vortex experiences in the comments below. As you can tell I love this stuff and I love hearing stories and personal experiences about it. You can never be too strange or woo woo for me!